«Having spent enormous amounts of money, human labor and time I did everything in my power to ensure that the technical and artistic level of the movie is appropriately high for an epoch-making film in our cinema» (Aleksandr Drankov). Sten’ka Razin has the distinction of being the first Russian dramatic production — a tribute to the determination of its producer, Aleksandr Drankov. When his first seventeen actualities failed to win serious attention in early 1908, he answered the widespread call for Russian-made films with Sten’ka Razin. 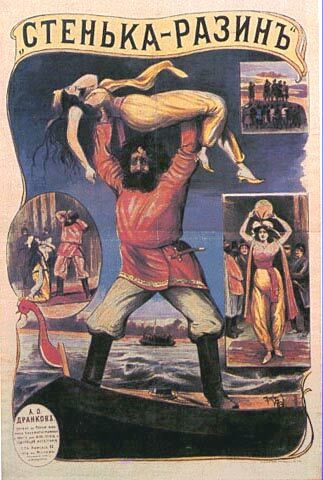 This account of the popular brigand leader who dallied with a captured Persian princess was adapted from a traditional ballad “From the Island to the Deep Stream” and Drankov commissioned original music to accompany his film from no less than Ippolitov-lvanov, then head of the Moscow Conservatoire. Energetic promotion ensured the film’s commercial success and launched Drankov’s career as a producer.